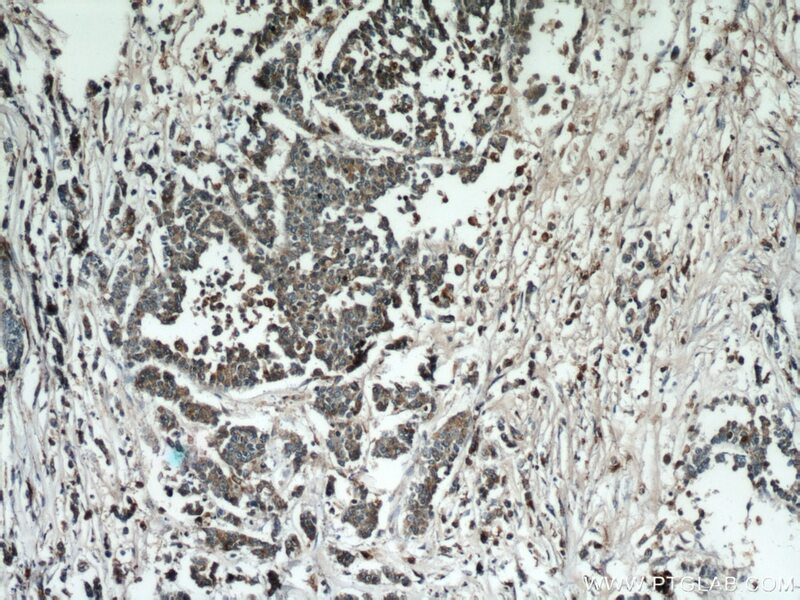 Immunohistochemical analysis of paraffin-embedded human ovary tumor tissue slide using 12216-1-AP( Cathepsin B Antibody) at dilution of 1:200 (under 10x lens). 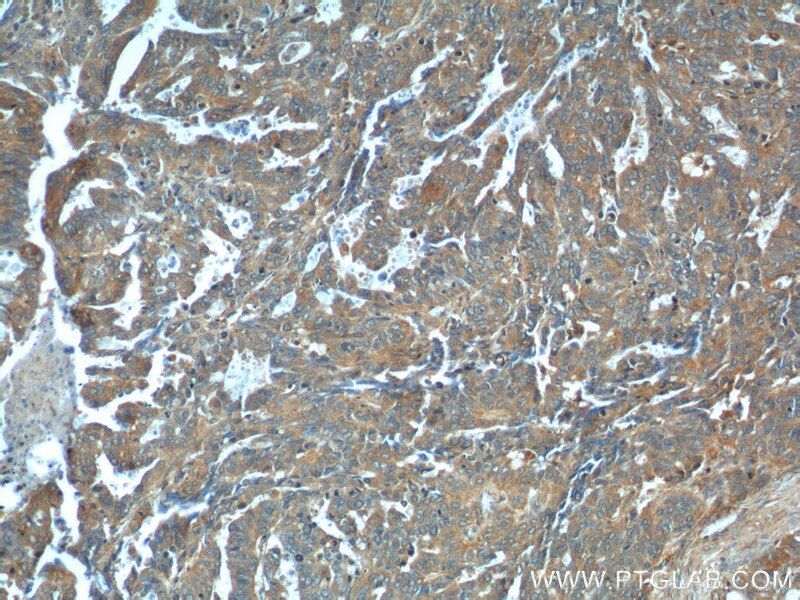 Immunohistochemical analysis of paraffin-embedded human ovary tumor tissue slide using 12216-1-AP( Cathepsin B Antibody) at dilution of 1:200 (under 40x lens). 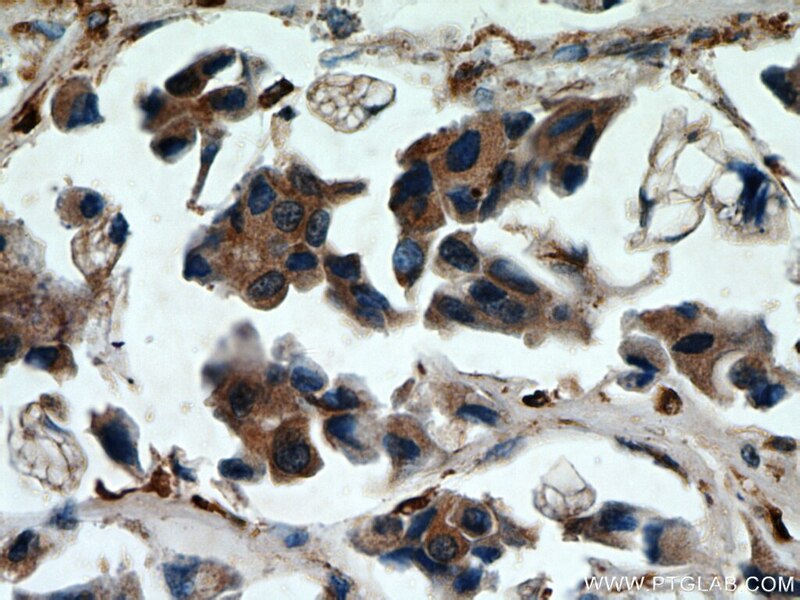 1X10^6 MCF-7 cells were stained with 0.2ug Cathepsin B antibody (12216-1-AP, red) and control antibody (blue). Fixed with 90% MeOH blocked with 3% BSA (30 min). Alexa Fluor 488-conjugated AffiniPure Goat Anti-Rabbit IgG(H+L) with dilution 1:1500. 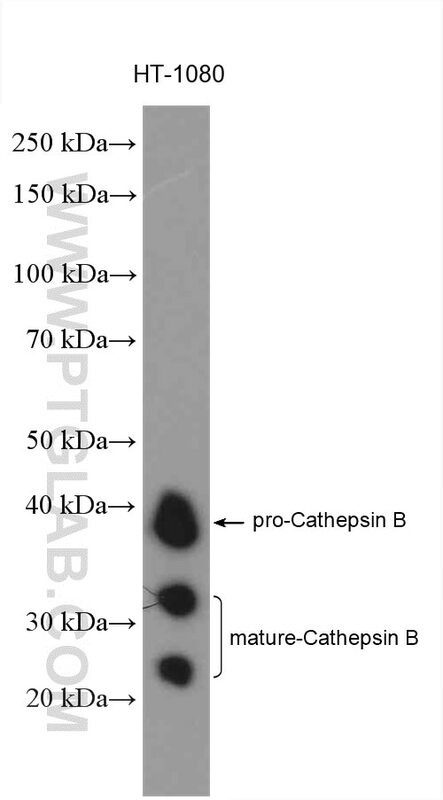 CTSB(Cathepsin B) is also named as CPSB and belongs to the peptidase C1 family. 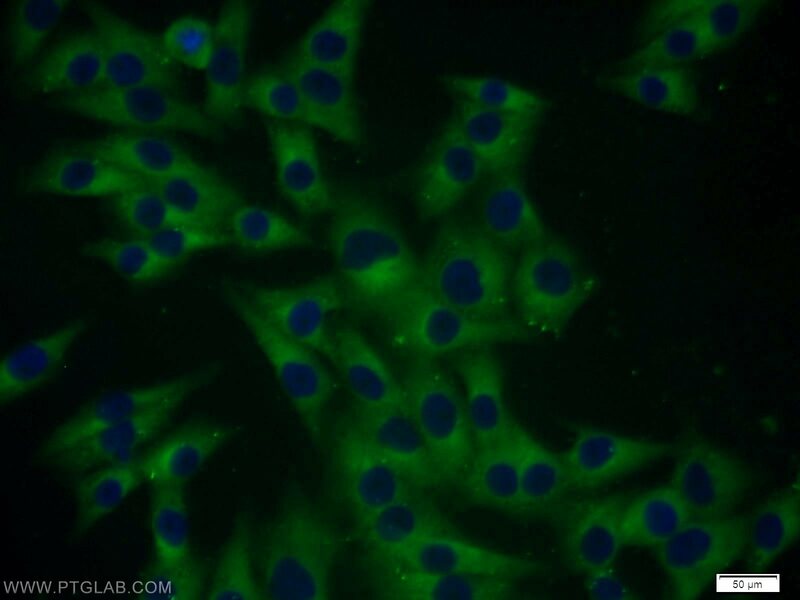 It participates in intracellular degradation and turnover of proteins. Cathepsin B precursors found in human malignant ascites fluid do not possess mannose-rich carbohydrates suggesting that a defect in the post translational processing of carbohydrate moieties on tumor. Cathepsin B exists as both glycosylated and unglycosylated forms(PMID:1637335). 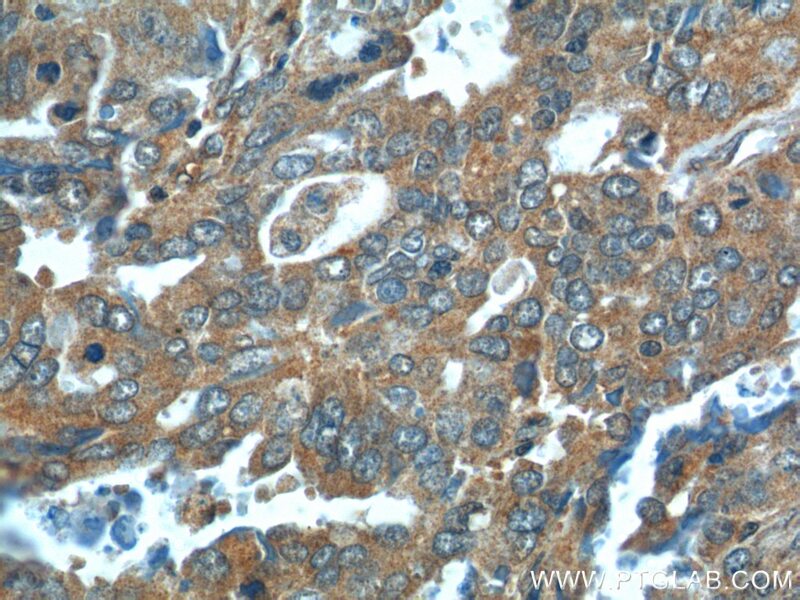 In rat macrophages and hepatocytes pro- cathepsin B is 39 kDa (unglycosylated =35 kDa), whereas in human fibroblasts procathepsin B is 44.5-46kDa (unglycosylated=39kDa)(PMID:2097084). 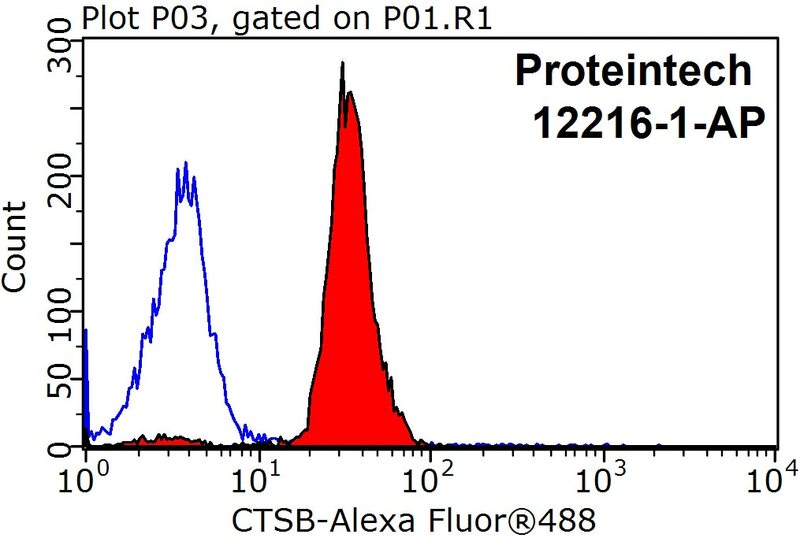 It can be detected the 43 kDa form of pro-CTSB, 31 kDa and 25 kDa marure forms in mouse brain by western blot(PMID:20616152). Host-derived, pore-forming toxin-like protein and trefoil factor complex protects the host against microbial infection. 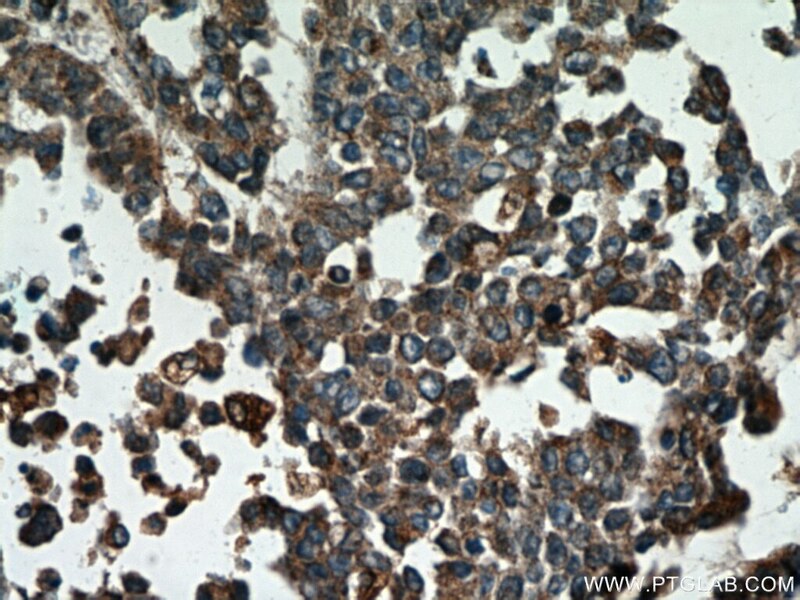 Expression of cystatin C and its effect on EC9706 cells in esophageal carcinoma. 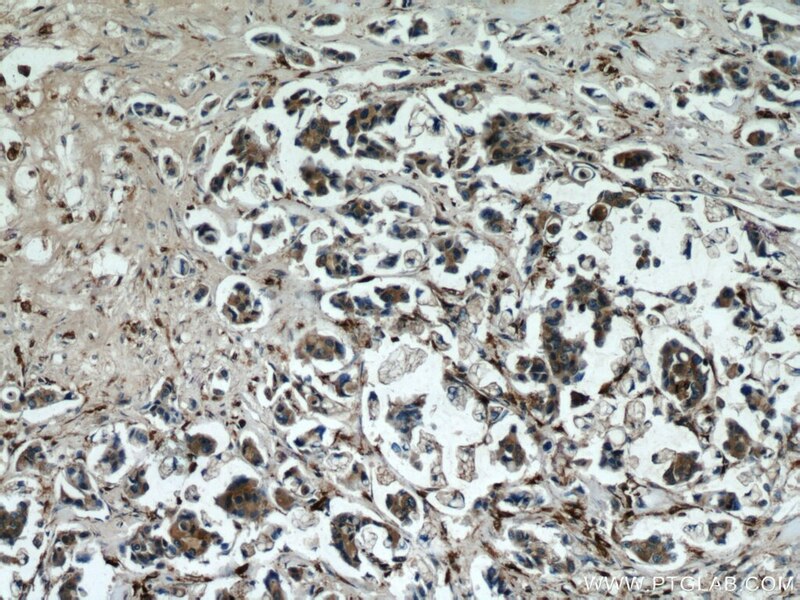 Expression profile of cathepsins indicates the potential of cathepsins B and D as prognostic factors in breast cancer patients. The role of NLRP3-CASP1 in inflammasome-mediated neuroinflammation and autophagy dysfunction in manganese-induced, hippocampal-dependent impairment of learning and memory ability. Dietary eicosapentaenoic acid normalizes hippocampal omega-3 and 6 polyunsaturated fatty acid profile, attenuates glial activation and regulates BDNF function in a rodent model of neuroinflammation induced by central interleukin-1β administration. Green Tea Polyphenols, Mimicking the Effects of Dietary Restriction, Ameliorate High-Fat Diet-Induced Kidney Injury via Regulating Autophagy Flux.